Insert Disc 1. Select the "Extras" option at the main menu. Highlight the "Character Bios" option and press your Up button to highlight the "Extras Menu" text. Press your Enter button to view the introduction and ending sequences without text. Alternately, insert Disc 1 and advance to Title 7. Insert Disc 2. Select the "Character Bio" option, then highlight the last biography and press your 1 button. 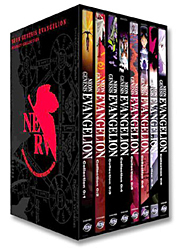 At the end of each episode in the "ADV Film" series of "Evangelion", while watching the credits and listening to the jazz tune "Fly Me to the Moon", cycle through the different language options (using the menu for standard DVD players or the Right Analog-stick with a PlayStation2). Each language offers a different version of the song, even though the lyrics are still in English for each version.